Autumn is my favorite color! There is something magical about the deeper, warmer colors of autumn that gets my creativity going. RED is perfect color for me right now. The deep browns, purples, and burgundy tones are coming, but since it’s still not quite all the way fall yet, those reds have my heart thumping loudly. Here on my little side table in the kitchen, I layered a piece of antique French ticking over the top. It has red stripes, so is a perfect choice for this display that features plenty of red. I love to combine the weathered, rustic antique pieces with natural materials – either flowers, leaves or in this case, rosy red and golden apples. In today’s post, it is easy to see my love for red. 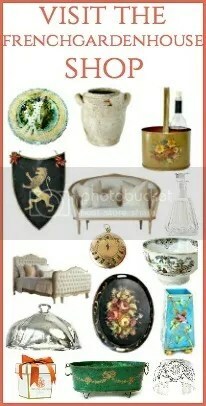 And by happy co-incidence, I actually found quite a lot of antique treasures on our last few buying trips with red. In the kitchen, the antique wood looks wonderful with red. The kitchen is the more French Country rustic part of our home, so the colors and the natural materials are a good fit. The natural linen sachets look so charming hanging from my antique French coat rack, and they smell so good! I usually have at least one of these hanging from the French armoire in our kitchen seating area too, year round. When I was younger, I collected “hearts” – and my Mom always tried to find another thing to gift me for holidays with a heart on them, so these heart shapes have a special meaning for me. I wish you all glorious autumn days! For our upcoming Floral Friday – this Friday – our theme is apples. Guess what color I bought? truly beautiful what you show us. I am fascinated by the warm colors … This composition is very beautiful because to the warm colors you add the luminosity of the white. I love that blank piece embroidered in red, as well as the other pieces stamped in red too. I congratulate you for such an excellent presentation. I am from Spain and friend of Pam. Thank you for your visit, Dolores! I am so happy to meet you here, and that you are a fellow lover of red and white makes me happy. And you certainly make everyday things and life beautiful! Gorgeous linens and oh that linen monogrammed towel!! Exquisite! Thank you friend. I am always trying to make everyday as beautiful as possible! Such beautiful vignettes, Lidy! I adore red and use it throughout my house. These pretty displays are perfect for autumn! Happy Tuesday, sweet friend!!! Oooo La-la!! Red my favorite! And I love my little heart with la tour Eiffel that I recently purchased from French Garden House. Such beautiful pictures to wet my appetite even further for Fall! !